Popular fashion includes black & white together. Crisp and bright, we offer this combination by many of our designers in jewelry, handbags and accessories. 2-1/8 inches long on sterling earwire, 5/16 inch across. Slender blade shapes in metal are finished in darkened shiny silver, speckled white/silver, and black with white veins pattern. 2-3/8 inches long, 7/8 inch across. Clip on style for all ears. Lead-free pewter elements have brushed shiny top finish, with recessed areas blackened. Clean square motif on top is joined to the blanket weave chevron patterned oval below by a shiny black-and-ivory dimpled bead. The style is both deco and southwest by the lovely combination of patterns and components. 2-3/8 inches long, 7/8 inch across. Surgical post. Lead-free pewter elements have brushed shiny top finish, with recessed areas blackened. Clean square motif on top is joined to the blanket weave chevron patterned oval below by a shiny black-and-ivory dimpled bead. 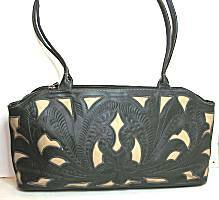 The style is both deco and southwest by the lovely combination of patterns and components. 1 inch square, surgical post located 3/8 inch below top point, to be worn at angle shown. 2-3/8 inches long on surgical earwire, 1 inch across. 3 polymer clay pieces adorn center, longest is 2-3/8 inches. 25 inch necklace has goldplated toggle clasp, beaded with vintage Czech glass, howlite, hematite, snowflake obsidian and onyx gemstones, glass seed beads. Pendant measures 2 inches, tied onto gray satin cord at 27 inches long (no clasp). Pin measures 1-1/2 x 1-1/8 inches, barpin clasp to wear at angle shown. Pin measures 2 x 1-3/8 inches, barpin clasp to wear at angle shown. By The Artful Soul, pin set in mixed media polymer clay and resin. The pin is about 2 inches across, though can be worn at various angles, the goldfill chain will drape downward. Silver polymer clay background hold the folded B&W web pattern clay, shiny resins fill in bright red, jet black, and ivory, accented with a single yellow topaz Swarovski crystal and glass beads. Earrings of the same components are 3/4 inch across, surgical steel post. 2 x 1-1/2 inches, easy size to wear and light in weight, this pin has colorful beads arranged to depict the cow. Velveteen on the back. 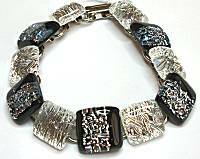 Wondrous abstract motif in bracelet with irregular edges and patterns within, formed from beads in bright black and white colors, secured to black fabric backing. 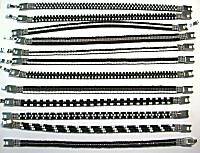 Up to 1-3/4 inch wide, the ends have silver beaded ribbon attached to foldover metal clasp. Goes around wrist smoothly, 7-1/8 inches long, can be worn snug. About 1 inch across, colorful beads surround a silver stud at center. 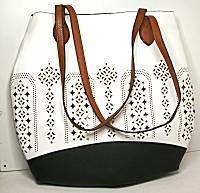 The colors include bright white and black, secured to black fabric backing. CLIP ON style for all ears. Colorful beads are secured to flexible black fabric backing, formed into elegant flat pod shape and suspended from elongated silverplated earwire that has a sleek contemporary shape befitting the earring style. About 2-5/8 inches long overall, 3/4 inch across, the colors are bright white, gray and black. The figure-8 shape is defined by tiny beads mounted securely onto black fabric backing. Larger clear pieces at the center are surrounded by black, white, and silver colors. About 2-1/2 inches long including the elongated and gracefully shaped silver plated earwires, 7/8 inch across. 1/4 inch wide, about 6-3/4 inches long, skinny bracelet has beads secured to black backing, silver beaded ribbon on the ends attaches to foldover clasp. Designed to circle the wrist smoothly, may be worn snug. EACH skinny bracelet will have a different motif in colors of black and white. Cannot specify exact design or color combo, if you order several each one will be different! 1 inch long on sterling earwire, 1/2 inch across. A jet black crystal frame with faceted edges has a silvertone inset filled with smaller jet crystal and clear crystals/beads. Black and white dotted fabric coin purse with curved zipper top, has a fabulous satin flower on the front! Interior lined in the same satin color fabric. Zipper pull has clear crystal bauble. Measures 4 x 4 inches. Earrings are 1-3/8 inches tall, 1-1/8 inch wide at the bottom, and fairly flat profile. The porcelain is colored black and ivory in various patterns, with gold. CLIP ON style for all ears. 1-7/8 inches long on sterling earwires, 3/8 inch across. Custom cast metal elements are plated in satin silver, opalescent misty crystals at top, a luminous frosty glass flower set in black enamel at center, and golden topaz crystals dancing around an art glass bead as fringe. 1-5/8 inches long on sterling earwires, 7/16 inch across. Custom cast metal elements are plated in satin silver, a luminous frosty cabochon set in the bottom element and a clear crystal at the top, black crystal dangling below. Adjustable 18-20 inches long, lobster clasp, sterling chain. Pendant drops 1-1/2 inches, moves freely on chain. Custom cast metal plated in silver holds iridescent cloudy white crystals, an opalescent frosty white flower glass with black enamel in background, and dangling gold beads. 1/2 inch squares of fused glass with dichroics, are joined onto silvertone metal link chain that gracefully wraps the wrist, closing at 7-1/4 inches long with foldover clasp. The colors pieces are alternated for dramatic black and white ice effect, look into them to see a texture background that explodes like shards of sparkling silver. A pair of square and oval fused dichroic glass elements are dangled with hematite bead to make a pendant 1-1/2 inches long including and 1 inch across. Black and a center of textured background that pops with silvery ice shards from within, glowing silver oval under clear. Comes on this 16 inch black rubber cord with lobster clasp.